Participants : C. Canudas de Wit [Contact person] , N. Cardoso de Castro, K. Johansson [KTH] . Previous work in  , about energy-aware communication and control co-design in wireless Networked Control Systems (NCS), was focusing on energy-aware and entropy coding in NCS. To enlarge our vision of this topic, we carried out a survey about energy-aware communication and control co-design. This work has been done by Nicolas Cardoso, Carlos Canudas de Wit and Karl-Henrik Johansson and has led to a publication at the NecSys'10 conference,  . Because energy is a key resource in NCS, in particular in applications concerning wireless networks, we reviewed the multi-layer architecture of those systems in the light of their energy-use, and we pointed out major contributions in the area of energy-management policies, layer per layer. This review of the literature is organized according to the layered communication architecture, covering, from bottom to top, the Physical, Data Link, Network, and Application layers. We have specifically focused on advances that concern energy-aware management in wireless communication and control co-design. It is argued that existing work is limited to single layer approaches, with a lack of design methods taking into account several layers. This work helped us to understand how energy is consumed in wireless network nodes and to identify the most interesting topics to put our efforts on. We noticed that an important amount of energy is wasted in idle-listing, i.e. when a node is fully woken up, ready to transmit and to receive without any message to send or receive. Many radio ships in wireless nodes embed low-consuming radio modes to save energy. These low-consuming modes are alternative modes between fully awake (ON) and fully asleep (OFF) modes. We focus now on the control of these radio modes in order to save further energy in NCS. Participants : C. Canudas de Wit [Contact person] , A. Farhadi, J. Jaglin, J. Dumon. An interesting application where the data-rate constraint is hard, is the control of oil well drilling, where information from the sensors to the controller is transmitted via an acoustic channel, with little data-rate and relevant delay. In oil well drilling operations, one of the important problem to deal with is represented by the necessity of suppressing harmful stick-slip oscillations. A control law named D-OSKIL mechanism uses the weight-on-the-bit force as a control variable to extinguish limit cycles. It uses the value of the bit angular velocity that is found through an unknown parameter observer by means of the measure of the table rotary angular speed. To improve this former estimation, we add the measurement of the angular velocity of the bit that, due to the technological constraints, arrives delayed. This new design leads us to the analysis of a time-varying delay system. This work has been presented at ACC 2010  . Participants : C. Canudas de Wit [Contact person] , W. Jiang, J. Dumon, O. Sename. We have initiated studies on adaptive image coding in the context of tele-operation. In here we trade issues on Quality of Service (quality of image) with quality of control. In our first investigations, we have proposed a new image coding algorithm for the wireless controlled electrical vehicle (scale 1/3). The tele-operation system is based on a mathematical driver model written in the spatial equation form (model that we have also proposed), where the driver is considered as a feedback controller. An optimal quality parameter for image compression is calculated by an iterative method which takes into account the trade-off between the network time-delay and image network flow rate. Two papers have been submitted: one for the ACC 2011, and another with the driver model for the IFAC WC 2011. The studies reported in this subsection concern the data transmission over unknown non-orthogonal fading channel in scenarios involving several agents, sensors or actuators. In most of works, the nodes are organized in a network where each sensor processes its individual measurement and transmits the result over an orthogonal multiple-access channel (MAC) to the sink node. In such channels, collisions and interferences between nodes are avoided so that the main impairment of the communication channel concerns noise. Orthogonal MAC can be obtained using TDMA (Time Division Multiple Access), FDMA (Frequency Division Multiple Access) or CDMA (Code Division Multiple Access) protocols. In the first one, the time is divided into slots allocated to each node. Such a scheme induces a latency that can be crucial for feedback control. In the second one, the bandwidth is divided into sub-band allocated to each user. The bandwidth being limited, scalability is a crucial question in this case. For the third scheme, each node is assigned a signaling waveform (or code) generally assumed to be orthogonal, equi-correlated and perfectly correlated with a perfect synchronization in node transmissions  . In addition to noise, wireless transmissions are also subject to fading. In most works on wireless transmission for control and estimation, fading is in general ignored or assumed to be known. In a recent work, a distributed estimation scheme including a channel estimation using pilot signals was suggested  . The derivations were made for parallel channels in a fusion center based wireless sensor network (WSN). It is necessary to point out that the number of parallel channels is limited by the bandwidth and the number of nodes in the network. Space-time block processing coding and modulation schemes can also be considered. For scenarios in which there is perfect channel state information (CSI), several linear precoding systems have been proposed (see  and references therein). However, in practice the CSI at the transmitter suffers from inaccuracies caused by errors in channel estimation and/or limited, delayed or erroneous feedback  . The derivation of robust coding methods with few or no knowledge on the transmission channel is then a topic of particular interest. By considering non-orthogonal unknown fading channel, multiple transmitting node and a single sink node, we have introduced two kinds of precoding where the CSI is not required. In the first one, data are doubly spread before transmission. The precoding can be viewed as bilinear  . The second one is a nonlinear (polynomial) precoding scheme. The proposed nonlinear precoding scheme gives rise to a homogeneous Volterra-like input-output equation whose inputs depend on the coding sequence whereas the kernel depends on the informative symbols and on the channel parameters  . Both schemes give rise to multidimensional and multilinear data which can be viewed as tensors ,  . The performance of the polynomial approach is depicted in Fig. 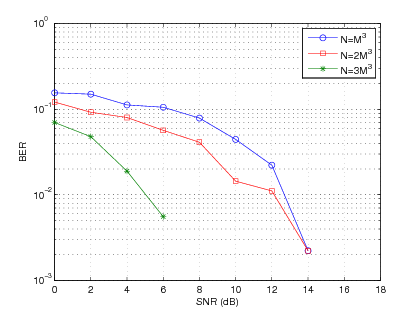 6 and 7 we plot the BER according to the signal-to-noise ratio (SNR). Figure 6. Performance evaluation with different number of rows for the encoding matrix (ALS-PARAFAC case). Figure 7. Performance evaluation with different number of rows for the encoding matrix (Joint diagonalization). In general, the proposed decoding methods give good results. Significant improvements are obtained by increasing the number N of rows for the encoding matrix. That is an expected result since by increasing the number of rows for the encoding matrix, the least squares estimation of the data tensor is improved. 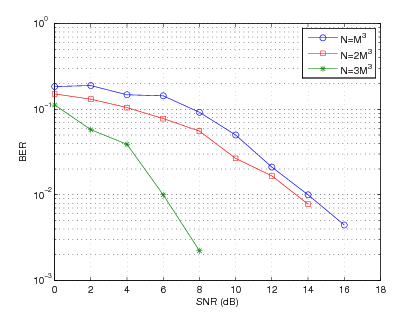 The improvement is particularly significant for SNR values higher than 2 dB. Participants : A. Kibangou [contact person] , C. Siclet, L. Ros, J. Dumon. Wireless underwater communications can be established by transmission of acoustic waves. The corresponding transmission channels are generally recognized as one of the most difficult communication media to use today. The bandwidth available for communication is extremely limited. Although the communication bandwidth is very low, underwater acoustic channels are, in fact, wideband due to the small ratio of carrier frequency to the signal bandwidth. Sound propagates at a very low speed ( m/s), and propagation occurs over multiple paths. Delay spreading over tens or even hundreds of milliseconds results in frequency selective signal distortion, while motion creates an extreme Doppler effect  . The OFDM (orthogonal Frequency Division Multiplexing) technique, a multi-carrier modulation scheme in which broadband data is effectively transmitted in parallel as K narrowband channels on K orthogonal subcarriers, has been claimed to be one of the most promising communication technologies for achieving high data rate and large system capacity  . It allows designing low complexity receivers to deal with highly dispersive channels  . This facts motivates the use of OFDM in underwater environments. In order to adequately recover the transmitted information, algorithms at the receiver must include estimation and compensation of the Doppler scaling factor, channel estimation, and information symbols estimation. Several approaches have been suggested in the literature for estimating the Doppler scaling factor. They are based on the use of preamble and postamble of a packet consisting of multiple OFDM blocks  or by exploiting correlation induced by the cyclic prefix  . Then, the received signal is resampled by using a sampling period related to the estimated Doppler scaling factor. When the Doppler scaling factor is estimated using a preamble and/or a postamble of a packet, it is necessary to add the estimation and the compensation of residual carrier frequency offset (CFO) since the Doppler can varies between consecutive OFDM blocks inside a given packet. We have derived new per-block data processing algorithms based on high resolution harmonic estimation methods for estimating both Doppler scaling factor and channel parameters (path gains and delays). Then the informative symbols are estimated using zero-forcing or MMSE (Minimum Mean Square Error) based equalization schemes. The advantage of the proposed scheme is to avoid data resampling and residual CFO estimation and compensation  ,  ,  . We have also designed specifications and the packet loss law to be implemented in the CONNECTSIM software. An overview on our tools for underwater communication can be found on the FeedNetBack report  . Participants : C. Canudas de Wit [Contact person] , A. Farhadi, S. Zampieri [Università di Padova] , L. Schenato [Università di Padova] . One of the objectives of the NeCS team is to propose a co-design framework, which allows the integration of control, communication, computation, complexity, and energy in Networked Control Systems (NCS). As a first step to create such a co-design framework, we have to fully understand the constraints imposed by control, communication, computation, complexity, and energy on some case studies. Therefore, in  , we studied the three case studies of the FeedNetBack European project: 1) Fleet of underwater vehicles, 2) Smart network of surveillance cameras, 3) Smart network of cameras for motion capture. Then, following this study, we identified the interactions between control, communication, computation, complexity, and energy in these case studies. Next, we formulated an integration framework for control, communication, computation (3C) co-design for fleet of underwater vehicles and smart network of surveillance cameras. Right now, we are developing the formulated 3C co-design framework for the fleet of underwater vehicles.